Shriram Navami is celebrated to proclaim the birth of Lord Shrirama, the seventh incarnation of Lord Vishnu. The celebrated hero of the famous epic, 'Ramayana' and beloved god of Hindus, is enthusiastically celebrated on the ninth day of the waxing moon in the month of Chiatra, all over India. ‘The nineth day (Navami) in the bright fortnight of the Hindu lunar month of Chaitra is referred to as Ram Navami. On this day, when the five planets and the sun, etc. were in first house of cancer at noon along with the lunar asterism Pushya, Ramachandra was born in Ayodhya. Lord Vishnu is worshipped in his human incarnation as Rama, the divine ruler of Ayodhya. Celebrations begin with a prayer to the Sun early in the morning. At midday, when Lord Rama is supposed to have been born, a special prayer is performed. People sing devotional songs in praise of Rama and rock, images of him in a cradle to celebrate his birth. Rathyatras or chariot processions of Ram, his wife Seeta, brother Lakshman and devotee Hanuman are held from many temples. People gather in thousands on the banks of the sacred river Sarayu for a dip. Some observe a strict fast on this day. Several temples of Lord Rama celebrate this festival for nine days beginning from the first day (pratipada) of Chaitra. It is celebrated by periodic readings (parayans) of the Ramayan, organising spiritual discourses (kirtans) and beautifully embellishing Lord Rama’s idol. On the ninth day, in the afternoon a spiritual discourse on Lord Rama’s birth is held. At noon, a coconut draped in a hooded cloak is placed in a cradle and the cradle is rocked. Devotees shower a red, fragrant powder (gulal) and flowers onto it.’ Celebrations of Ram Navami start on Gudi padwa, the first day of Chaitra; and continue for 9 days. During this period, devotees do parayans of Ramayan, recite the Ramarakshastotra, sing bhajans-kirtans in His praise and chant His name. Ayodhya is the focus of great celebrations. 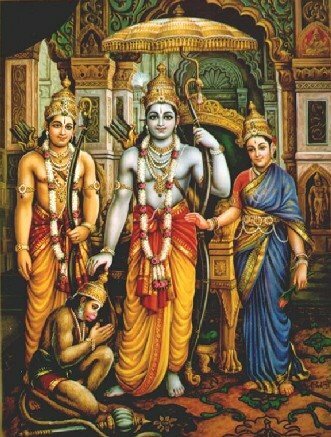 Devotees throng the temples of Ayodhya and Pondicherry, two places closely connected with the events of the Ramayana to participate in Ramnavami festivities.Sri-Ramnavami is dedicated to the memory of Lord Rama. It occurs on the ninth day (navami). The festival commemorates the birth of Rama who is remembered for his preperous and righteous reign. Ramrajya (the reign of Rama) has become synonymous with a period of peace and prosperity. Mahatma Gandhi also used this term to describe how according to him, India should be after independence. Ramnavami occurs in the month of March. Celebrations begin with a prayer to the Sun early in the morning. At midday, when Lord Rama is supposed to have been born, a special prayer is performed. 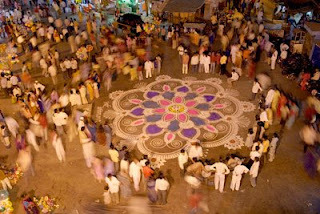 In northern India especially, an event that draws popular participation is the Ramnavami procession. The main attraction in this procession is a gaily-decorated chariot in which four persons are dressed up as Rama, his brother Laxman, his queen Sita and his disciple Hanuman. Several other persons dressed up in ancient costumes as work by Rama's solders accompany the chariot. The procession is a gusty affair with the participants shouting praises echoing the happy days of Rama's reign.Surya - The Sun was recognised as the source of light and heat even in ancient times. The importance of the Sun was much more in the higher latitudes from where the Aryans are supposed to have migrated into India. Many royal dynasties portrayed symbols of virility like the Sun, Eagle, Lion etc. as their progenitor. Rama's dynasty considered them to have descended from the Sun. This could have led to the tagging on, of Rama's birthday to a festival devoted to the sun.On the face of it Sri-Ramnavmi appears to be just a festival commemorating the reign of a king who was later deified. But even behind present-day traditions there are clues, which unmistakably point to the origin of Ramnavmi as lying beyond the Ramayana story. Sri Ramnavami occurs at the beginning of summer when the sun has started moving nearer to the northern hemisphere. The Sun is considered to be the progenitor of Rama's dynasty, which is called the Sun dynasty (Raghukula or Raghuvamsa, Raghu means Sun and Kula or Vamsa mean familial descendant). Rama is also known as Raghunatha, Raghupati, Raghavendra etc. That all these names begin with the prefix Raghu is also suggestive of some link with Sun worship. The hour chosen for the observance of the lord's birth is that when the sun is overhead and is at its maximum brilliance. In some Hindu sects, prayers on Ramnavami day start not with an invocation to Rama but to Surya (sun). Again the syllable Ra is used in the word to describe the sun and brilliance in many languages. In Sanskrit, Ravi and Ravindra mean Sun. Significantly, the ancient Egyptians termed the sun as Amon Ra or simply as "Ra". In Latin the syllable Ra is used to connote light. For example, we have Radiance which emission of light, or Radium, which means any substance emitting light or brilliance. The common element is the syllable Ra that in many languages is used to derive words for describing Sun or light. The occurrence of this syllable in most names used for Rama along with other clues is strongly suggestive that the festival Ramnavami antedates the R- ayana and it must have originated much before the Ramayana, as a 'Sun-festival' for invoking the Sun who was recognised as the source of light and heat even in ancient times. The importance of the Sun was much more in the higher latitudes from where the Aryans are supposed to have migrated into India. Many royal dynasties portrayed symbols of virility like the Sun, Eagle, Lion etc. as their progenitor. Rama's dynasty considered them to have descended from the Sun. This could have led to the tagging on, of Rama's birthday to a festival devoted to the sun.There is some link between Lord Rama and Sun Worship. The Sun is considered to be the progenitor of Rama's dynasty, which is called the Sun dynasty (Raghukula or Raghuvansha, Raghu means Sun and Kula or Vansha mean familial descendant). Rama is also known as Raghunatha, Raghupati, and Raghavendra etc. That all these names begin with the prefix Raghu is also suggestive of some link with Sun worship. The hour chosen for the observance of the lord's birth is that when the sun is overhead and is at its maximum brilliance. Significantly, the ancient Egyptians termed the sun as Amon Ra or simply as "Ra". In Latin the syllable Ra is used to connote light. For example, we have Radiance which emission of light, or Radium, which means any substance emitting light or brilliance. The common element is the syllable Ra that in many languages is used to derive words for describing Sun or light. In the Ramayana, Dasarath, then king of Ayodhya, is believed to have had three wives named Kaushalya, Sumithra and Kaikeyi. Their greatest worry was that they had no male children, and so they had no heir to the throne. Rishi Vasistha suggests him to perform Puthra Kamesti Yagna, through which he can have a desired child. 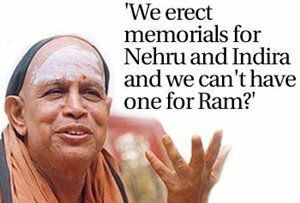 He also tells him to bring Maharshi Rushya Shunga to perform this Yagna for him. Immmediately King Dasharath gives his consent, and heads to Maharshi Rushya Shrunga's ashram, to get him. Maharshi agrees and will accompany Dasharath to Ayodhya (Capital of Avadha) and performs the yagna. As the result of yagna, Yagneshwar appears and hands Dasarath a bowl of Payasam and asks him to give it to his wives. Dasharath gives one half of the payasam to his elder wife Kausalya, and another half to his younger wife Kaikeyi. They both give half of their portions to Sumithra. After few days all three Queens conceive. On the ninth day (Navami) of Chaithra Masa (first month in hindu calendar), at noon Kaushlya gives birth to Lord Sri Ram, Kaikeyi gives birth to Bharath, and Sumithra to twin boys, Lakshman and Shatrughan.Lord Ram is the seventh incarnation of Lord Vishnu, who takes birth on earth when Adharma over rules Dharma. He protects all his devotees by vanquishing the roots of Adharma. Lord Ram was born on earth to destroy the demon named Ravan. Lord Vishnu took the seventh avatar as Lord Ram to destroy the demon King Ravana. Ravana was very powerful and his tyranny knew no bounds. Sages were not able to perform their rituals under his reign. So, to destroy Ravana, Lord Vishnu took his seven avtaar as the son of Kaushalya, the first queen of king Dasharath. The king had two other queens, Kaikeyi and Sumitra and three children from them - Bharat, Lakshman and Shatrughna. Lord Rama was born on the ninth day of the Hindu month Chaitra and that is why that day is called Ram Navami. 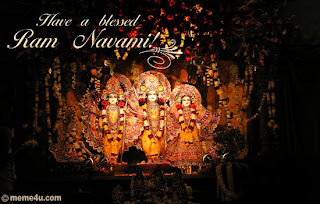 Ram Navami is one of the most important festivals of the Vaishnav sect of Hindus. In some parts of India, it is a nine-day festival known as Vasanta Navratri.Ram Navami is celebrated with religious fervour. On this day, people observe a fast. Many devotees fast for nine days. In all the Ram mandirs, Aarti and Pooja are performed during the noon hours, the time of Lord Rama's birth. At the end of the rites and rituals, which includes abhishek of Lord Rama and Shiva and chanting of Bhajans, the priest performs the peace chant with sprinkling of consecrated water. Prasad of sweets and fruits is given to people attending the pooja. 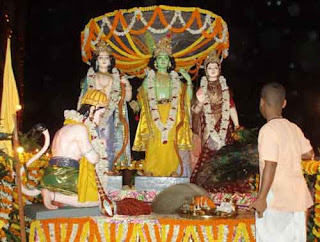 Many devotees stay awake on the previous night, in anticipation of Lord Ram's birth. A havan is performed and they sing devotional songs in praise of Lord Ram and rock his image in cradles to celebrate his birth. On Ram Navami day, all the Ram temples are beautifully decorated. the idols of Lord Ram, his wife Sita and his brother Lakshman are adorned with new clothes, jewellery and flowers. 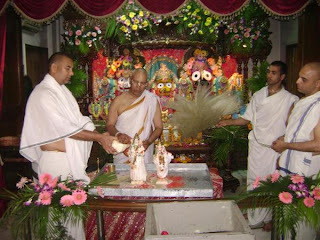 Devotees visit various Ram mandirs and offer sweets, flowers and fruits. Selected chapters on Ramlila of Ramayan are read, the most popular version being Tulsidas's Ramacharitmanas. A huge fair is held in Ayodhya on Ram Navami day, where thousands of devotees gather to celebrate this festival. Pondicherry is another place where many pilgrims visit the Ram temples. Processions accompanied by splendid floats of Rama, his wife Sita, his brother Lakshman and his monkey-general, Hanuman are carried out with great zest.